A completely unique and multi-dimensional training device, the BOSU(tm) Balance Trainer allows the user to combine all the elements of fitness: cardiovascular, toning, and flexibility in unique and highly effective combinations. Challenging and fun, BOSU(tm) gives a whole new meaning to "moving with control" as the user learns to workout on BOSU(tm)'s ever changing surface. Regardless of your sport or athletic ability, the BOSU Balance Trainer can help make you a better athlete! From rehabbing a reconstructed knee to setting world records, BOSU allows you to find your "point of challenge" and develop above and beyond that point! 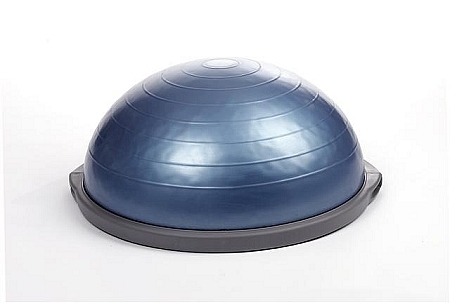 The New BOSU(tm) Pro Model with commercial design and durability uses a thick 8lb bladder. It has a dually over molded platform for extra strength. Has a non-skid, non-marking base. This package includes a BOSU Balance Trainer and pump.